Researchers at Harvard's Wyss Institute constructed a functional 3-D renal architecture that contains living human epithelial cells, and can recapitulate a small, critical function of the human kidney. Researchers from the Wyss Institute at Harvard have used 3-D bioprinting technologies to create a functional renal structure, the latest step in efforts to engineer human tissues and organs that can mimic native functions. Such tissues and organs could be used in drug screening, disease modeling, and possibly regenerative medicine. The 3-D structure was created to mimic a proximal tubule, a hollow tube that is a vital part of each nephron in the human kidney. The human kidney contains over 1 million nephrons, all of which work to perform the essential function of regulating the concentration of water and soluble substances by filtering the blood, reabsorbing what is needed, and excreting the rest as urine. The study is the result of previous work done at the Wyss Institute that aimed to bioprint living cells to form thick tissue using a customizable 3-D printed silicone gasket as a mold. The group used what they refer to as a "fugitive ink" to print a winding tubular shape similar to the structure of natural renal proximal tubules. Once the renal structures was printed, they then encapsulated the 3-D structure with another layer of extracellular matrix. Discover the latest about connected medical devices at BIOMEDevice San Jose, December 7-8, 2016. There have been a myriad of recent breakthroughs in 3-D bioprinting technologies as bioprinting materials and devices continue to advance. Earlier this summer researchers from the University of Bristol in the U.K. created a new bio-ink material that could lead to new 3-D printed ortho implants using human stem cells--a breakthrough that may help pave the way toward engineering human tissue from living cells. 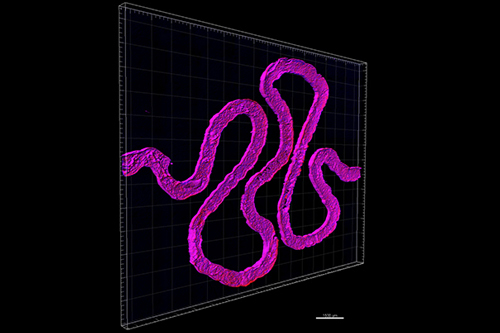 Back at the Wyss Institute a few years ago, researchers devised a method for creating tissues interlaced with blood vessels--a development that elped lead to the new 3-D bioprinted renal architecture. Moving forward, the research group believes this new renal architecture could be used as a platform to begin scaling up towards larger kidney constructs, as well as a means to explore other forms of complex functional human tissues and organs. The primary objective remains to open up new avenues toward engineering model systems for drug development, and eventually the engineering of whole organ implants. Despite the recent progress in 3-D bioprinting technologies, there are still plenty of roadblocks that need to be addressed before we usher in a new age of bioprinting human tissue. Researchers are still working to improve bioprinting accuracy, and there are also ethical issues such as the potential for an eventual black market for 3-D printed organs. Needless to say there are still quite a few hurdles left before we see bioprinting technologies reach their full potential. However, this latest study does provide some insight on the more immediate impact that 3-D bioprinting technologies could have, specifically within the realm of model systems for drug screening and disease modeling.